In a new trailer, Square Enix announced that their upcoming cinematic action game The Quiet Man will be released worldwide as a digital-only title for PlayStation 4 and Steam on November 1st, 2018. The game will cost $14.99 and can be completed in one sitting. The Quiet Man follows the story of Dune, a deaf protagonist who is searching a “soundless” world for Lala, a songstress who has been kidnapped by a mysterious man with a beak-like mask. Alongside the release date, Square Enix also revealed special limited editions that will be available at launch. From November 1st to the 15th, players who purchase from the PlayStation Store will receive the base game, a PlayStation 4 theme and a set of eight PSN avatars. Those who purchase from Steam will receive the base game and seven desktop and mobile wallpapers. 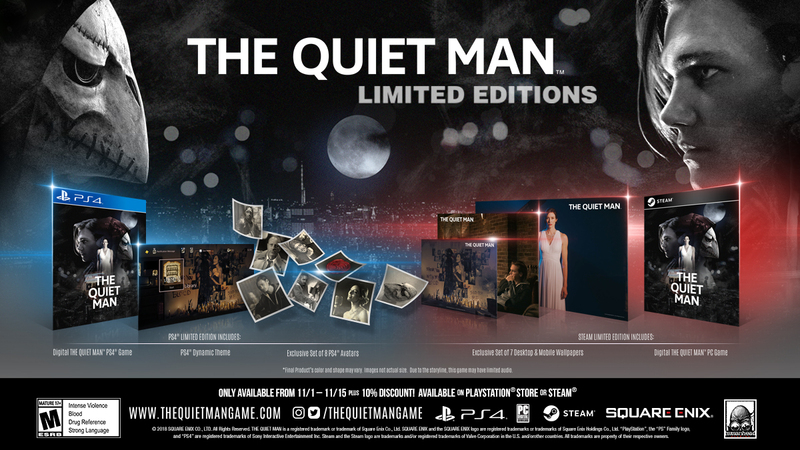 Additionally, those who purchase The Quiet Man within this time period on either platform will receive a 10% discount. The Quiet Man is scheduled for digital release on November 1st, 2018 for PlayStation 4 and Steam. Posted in The Quiet Man. Can’t Square Enix not just focus on the development of Final Fantasy XVI and stop producing this kind of nonsense nobody asked for?